Shup is probably the quickest way to share screenshots with anybody over the Internet. You can easily capture the whole desktop or an active window with this tool and then upload it directly to any of the five image hosting services included in Shup: Imageshack, Photobucket, Flickr, Stashbox and Waffle Images. 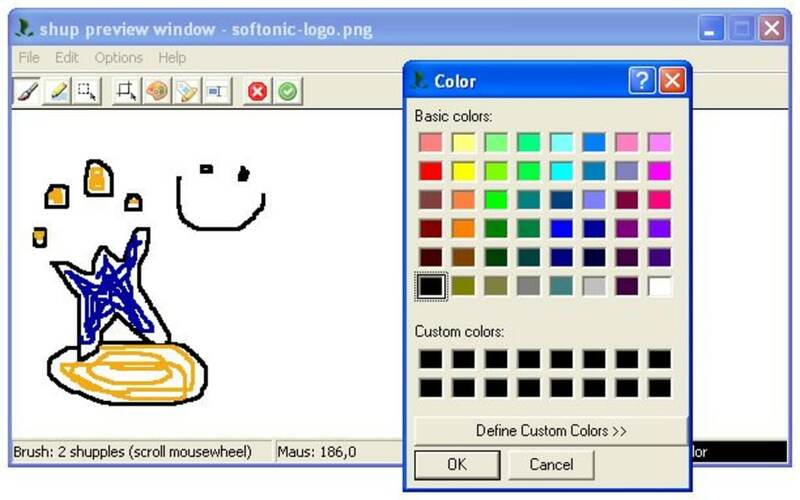 Besides taking snapshots, Shup includes a very basic graphic editor that you can use to create your own drawings and upload them to any of the previously mentioned image hosting websites. Despite including only those two capturing modes (desktop or active window) and having support only for PNG format, Shup is probably the fastest wat to upload any image taken on your PC. Shup is a small Windows utility that allows you to capture, edit, and share images (and other files) with ease! The global hotkeys allow you to initiate the capture of either the active window or your entire desktop. Each hotkey can be customized to your liking and has a variety of options to tweak, such as toggling the image editor and/or uploading of screenshots. The Shup image editor is invoked (if enabled) by the global hotkeys, and provides two basic tools: a paintbrush, with which you can paint in any color you wish to choose from the color palette dialog, and a rectangular marquee tool, which is rather insignifcant by itself but becomes quite useful when combined with flood fill and image cropping functionality. You can also change the filename of your image in this window, and switching to any of the supported tools and / or actions is supported by simple keyboard shortcuts (ie, R for rectangular marquee). Uploading files to your favorite file hosting site is no problem with Shup, which currently supports Stashbox.org, ImageShack, PhotoBucket, and WaffleImages. And after the file upload is complete, Shup places the file's URL into your clipboard for immediate sharing / spamming. What do you think about Shup? Do you recommend it? Why?